Malaysia celebrates her 58th Anniversary today. It was on August 31st, 1957 that the British colony became the federation of Malaya, referred to as Peninsula Malaysia or West Malaysia. Until September 16th, 1963, the country was still called "The Federation of Malaya." Many people still confuse this with another event called "Hari Malaysia" which was when the states of Malaya, Sabah, Sarawak, and Singapore, all came together to become Malaysia. Merdeka Day is about how Malaya became a sovereign state (1957). Malaysia Day is about how the Federation of Malaysia was born (1963). This year, two days before Merdeka Day is Bersih 4.0 which highlights a mysterious show of the best of Malaysians and the worst of Malaysian politics. Bersih 4.0 was conducted to showcase the best side of sanity and that democracy reigns supreme. From cars to buses, trains to planes, Malaysians from all over the country brave the threats of arrest and tear gas to gather at Kuala Lumpur in a sign of patriotism, unity, and solidarity. The largely peaceful crowd was aided by a well organized and restrained police force. Kudos to the Police and security forces in this regard. I even suspect that there are many within the police ranks who are increasingly sympathetic to the cause of Bersih. 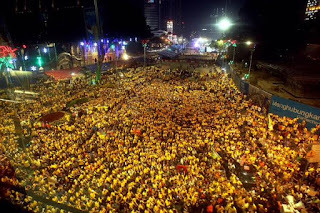 From August 29th to 30th, 2015, thousands of Malaysians descended upon Kuala Lumpur to gather for the Bersih 4.0 rallies. It was a peaceful demonstration against the ills of Malaysian politics, especially with the recent exposure of RM2.6 billion that was found credited into the personal bank account of the leader of the land: the Prime Minister. Explanations flowed from incredulous justifications like "donations from the Middle East" to "money being used to fight Jewish influence." Depending on where you read the news, or who you were hearing it from, there seemed to be a strategy of confusion used to deter attention from the glaring problem. The Americans call it wag-the-dog. I call it "the publicity haze." Many people voluntarily traveled to Kuala Lumpur, and other major cities both inside and outside of Malaysia to make their feelings known. From where I am, watching via the Internet, I saw unity. I saw solidarity. I saw a common call for integrity. The sea of yellow numbered in the tens of thousands. The place was like a carnival with people from all races and all religions coming together not with swinging accusations of racist rhetoric, but with singing of the national anthem: The Negaraku. Instead of heckling, non-Muslims remained respectful and quiet as their fellow Muslims say their prayers. Instead of discrimination, Muslims shook hands with non-Muslims. They embraced. They partied. They walked together. They declared with one voice that they are all Malaysians. Times have changed. The Malaysia of today is drastically different from the racially charged 60s and 70s. The racial politics of the past are no longer necessary to maintain law and order. Irresponsible religious rhetoric can even hurt the progress of the country. Unfortunately, I suspect that religions are not being used for the sake of religion. Neither are racist strategies used to protect the real interests of various races. They are increasingly being used sneakily to protect certain powers and to preserve preferential treatment for some influential people in society. It is a common strategy to use a straw man argument to deflect the attention from the main thing by bringing in non-related issues. It's a like a man cornered who then pointed to the opposite direction shouting: "Hey, what's that!" and then making his escape while attentions were directed toward that invisible object of interest. Making it illegal to wear yellow shirts with two words is one of the silliest rulings ever to be issued from the top. The efforts were futile. The people just wanted to make their feelings heard out loud and clear regardless of T-shirts, colour, and rhetoric. They care for their country. They worry for the future. They are angry at being taken for a ride. I hope the leadership will listen to the voice of the people, instead of dismissing them. More importantly, I pray they would be listening to the voice of conscience. What about the people who came? What can Bersih 4.0 really achieve? Will Bersih 4.0 change anything? Maybe not. Will the Prime Minister resign in the light of evidence of corruption? Unlikely. Will it lead to political change. Nah. But this one thing it will do. It showcases to the world that this is the NEW MALAYSIA. One that has all races coming under one banner. Malays, Chinese, Indians, and all, they are united because they care for the future of Malaysia. The political scene must reflect this unity. The road will be long. There is no sign that the current leadership will change at all. They seem to want to maintain the status quo even when the national currency is weakening, the national reserves are shrinking, public confidence are dwindling. and national unhappiness is mounting. What can Christians do? I like to share from the Psalms, about what do we do when we encounter situations of injustice or harbour strong feelings about wrongs in society. What is David praying about? Who are these rulers of injustice? Frustrated at the lack of justice faced by people in this world, he complains to God about how helpless he is feeling. When certain powers are on the throne, it is near impossible to dislodge them from their perch. Injustice like the rich benefiting from the misfortunes of the poor; Injustice like the story that the prophet Nathan had told King David about, how a powerful ruler chose to abuse his power by taking things unjustly from the poor. It is basically a plea for the infallible God of justice to deal with the fallible men. David is crying out to God to set things right in this world. He seeks out righteous rule on the land. He desires after the very things that God wanted. The question is: "When?" or "How long?" We can state upfront the problem exactly as it is. Feelings are real and it will be most unhelpful to suppress them. David expresses his thoughts as is, no holds barred. What better way than to open our hearts out to God? It is God who sees everything. It is God who is in charge. It is God that all rulers of this world have to answer to. For the ordinary folks who are powerless, who feel increasingly helpless, we can still appeal to God. From birth, we are already born with a sinful disposition. There is no need for an injection of a serum called "sin." There is no need to go to a University to get a Bachelors degree on how to sin. Parents do not need to teach their children about sin. People will naturally gravitate toward sinning, just like Scriptures say in Romans 3:23: "For all have sinned and fall short of the glory of God." David describes the extent of sin. Not only will the sinful person go astray, they spread all kinds of lies. They are like the venomous snake that poisons minds and kills the exercise of justice. They are drunk in power and corrupted with worldly riches. What then can people do with such leaders? As far as David is concerned, take it to the Lord in prayer. There is so much we need to pray to the God of Justice. When the law becomes used more and more as a weapon to oppress the calls for righteousness, justice, and fair rule, we know that things are not right. When the police and army are used to frighten ordinary folks who just wanted fair explanations of wrongdoing, we know that something is very wrong. When public statements made by public servants are incoherent, illogical, and immature, we know that they are trying to hide something. When various ministers start saying things that divide people, that cause hurts, that serves more self-interests instead of public interests, we know that the governance is rotten to the core. For what is legal in the country is not necessarily right. What's termed "illegal" in the country is not necessarily wrong. The vicious Idi Amin of Uganda knows that full well. He silences thousands of dissidents by mass executions. For him, the only good opposition is a dead one. Malaysia has not descended upon that route of mass executions and senseless killings. I hope it never will. We just do not want to underestimate the power of sin. Anger is a powerful emotion. What about helpless people expressing anger at injustice? If they take it to the existing authorities, will justice ever be done? Will they gain a sympathetic hearing? If the powers are corrupted in the first place, there is no recourse at all. Only further injustice and disappointment. For David, he could only express it before the Lord. Without physically hurting anyone or taking things into his own hands, he cried out to God to do the justice needed. Break the weapons of the corrupt rulers. Defang them. Make them vanish from the face of the earth. Whatever tools they use to oppress the common people, may they disappear into thin air. These sentiments project the inner emotions that only God can truly understand. David knew that it is futile to take on an entire establishment already bent on destroying the common good in favour of selfish gains. Jesus is the example of how the Jewish and Roman powers at that time abuse their authority, sending an innocent man to the cross. Instead of struggling against the punishments meted out on him, Jesus prayed: "Father, forgive them, for they do not know what they are doing." For Jesus knows that doing God's will is not about making things right according to the eyes of the world. It is doing God's will in accordance to the eyes of God. This may mean suffering for a little while until the right time and moment that only God knows. The time will come when justice will prevail, but not in the immediate future. Fifty-Eight years of racially charged and religious politics will not go away easily. I pray that the time will come when the ruling powers will no longer flash the racial or religious cards. Instead, they will remember that they are responsible for all citizens from all races. They will respect the rights of people to co-exist peacefully. They will offer up opportunities not according to skin colours or praying postures, not according to party affiliations or business relationships; but according to what is best for all our children, and our children's children. We may not be able to do much for now but we have a God who can do anything. We just need to be patient. We just need to wait. We just need to keep praying, keep hoping, and keep trusting that God will judge. In due time. Bersih 4.0 can only do so much. God can do much more. A whole lot more. THOUGHT: "Trust God. Do not give up, for the beginning is often the hardest."